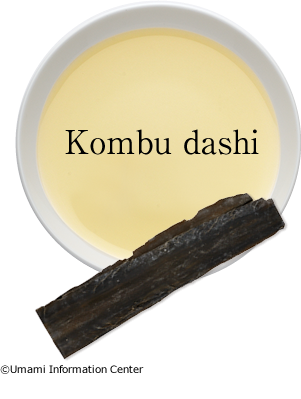 Kombu dashi is a dashi taken from the kombu, plant. The kombu is cultivated in Hokkaido and a part of Tohoku Japan. Ichiban dashi (first brewed dashi) is based on kombu dashi to which we add katsuobushi. In addition to the glutamate and aspartate of kombu, umami from katsuobushi; glutamate and nucleotide inosinate are added. With the aroma and flavor of katsuobushi, it has strong umami. In some ryotei, Japanese high-end resutaurants, use tuna bushi instead of katsuo bushi. A common way to make niban dashi (second brewed dashi) is to add half as much of the water used in ichiban dashi onto kombu and the katsuobushi used in ichiban dashi, then to cook it slowly. It brings stable umami and goes well with simmered dishes and miso soup. 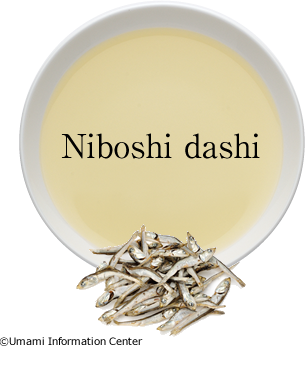 Compared to katsuobushi, niboshi dashi has a slightly more fishy taste. It can be used for dried food and pungent ingredients and miso soup. 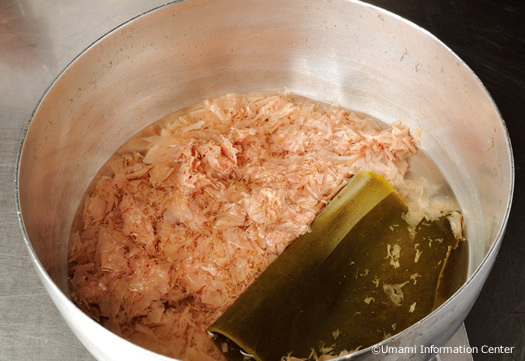 To prepare dashi for shojin, vegetarian dishes, kombu is mainly used. Fish and meat are not allowed to be used in Buddhism, so katsuobushi and animal bone cannot be used. Besides kombu, dried shiitake mushroom, soy beans, dried gourd or vegetable skin is used. Dried shiitake mushroom has a stronger umami and aroma out of these, however, its strong character unbalances the taste. So please be careful about how much you use. Umami Substance in Kombu dashi and Ichiban dashi from a luxurious traditional ryotei restaurant in Kyoto. The umami substance found in kombu dashi is glutamate alone, one of amino acids, while in ichiban dashi, were approximately same amount of the glutamate and inosinate, nucleotide. The graph shows the intensity of umami in kombu dashi and ichiban dashi. Kombu dashi contains umami of glutamate, a kind of amino acid. In ichiban dashi, the synergistic effect that occurs from glutamate and inosinate of nucleotide makes us taste umami 8 times more than the quantity of the real umami substance. 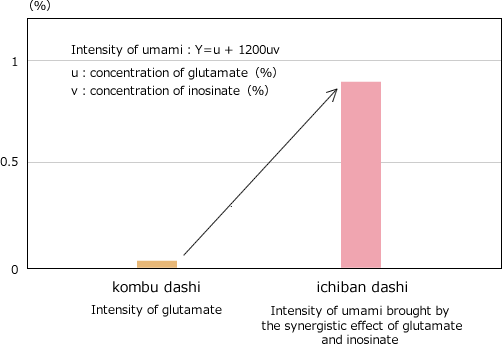 There is research saying that umami synergy becomes strongest when the amount of glutamate and inosinate is almost the same. So, the recipe of ichiban dashi served at the restaurant in Kyoto can be said to be very reasonable. Compared with the umami substance in kombu dashi and in ichiban dashi, the umami substance in ichiban dashi is twice that in kombudashi. However, when we taste it, ichiban dashi brings about a much stronger umami. This is said to be the synergistic effect of umami. The umami of amino acids and of nucleotic acids do not enhance the umami flavor in an additive way but multiply it many times over. 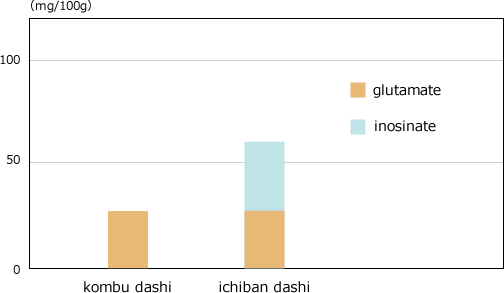 Furthermore, the other academic paper reports the same level of glutamate and inosinate brings the strongest synergy effect. Kombu is cultivated mainly in Hokkaido, Japan and the Tohoku region. The shape, taste and intensity of umami differs by origin. Kombu is one of the ingredients that contains the highest amount of umami. 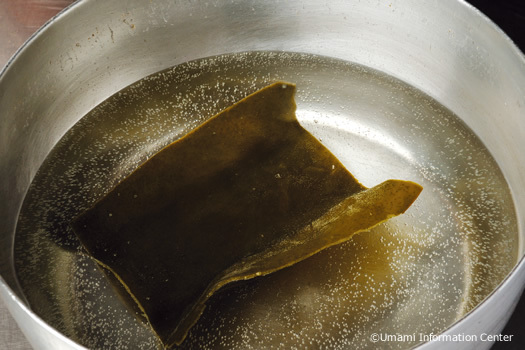 At the Umami Information Center, we prepare kombu dashi in the soaked or heated way. Place kombu and water in a container such as a bowl or a bottle. Keep it in a refrigerator overnight to bring out the kombu extract. ・1 L (33.8 fl oz.) of soft water*＊The Umami Information Center uses soft water with low mineral content. 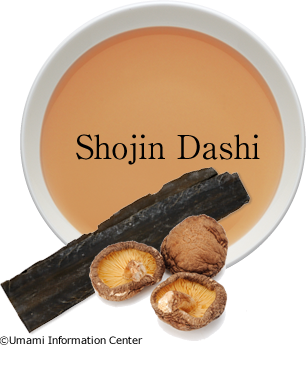 The dashi is called ichiban dashi and is suitable for subtle-tasting dishes, such as Japanese clear soup and steamed dishes. In the ichiban dashi, the flavor of katsuo is crucial. Let’s prepare it right before you use it. 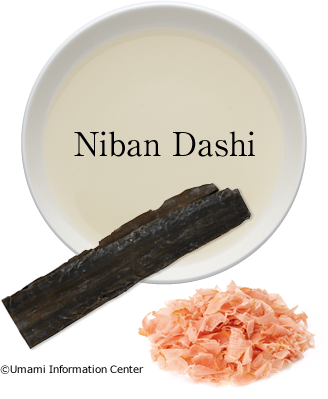 Niban dashi is made of kombu and kezuribushi, which used in ichiban dashi. Put them in 300ml water and boil for 2～3 minutes. This is suitable for miso soup and simmered dishes. 2. Take the kombu out right before boiling. Add shaved katsuobushi. 3. When it boils, stop heating and wait until the katsuobushi goes down to the bottom. Strain with a strainer. 1. 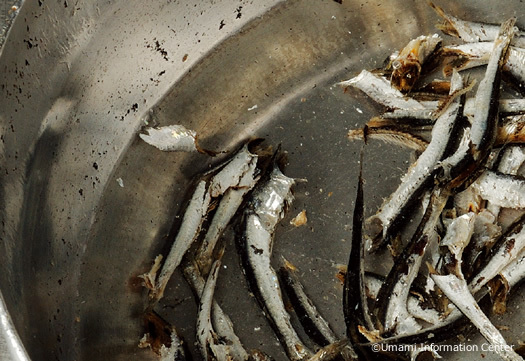 Remove the head and stomach of sardines by hand. 2. Place them in water and let them boil. 3. Skim off the foam and continue to heat for 4?5 minutes. Then, strain with a strainer. 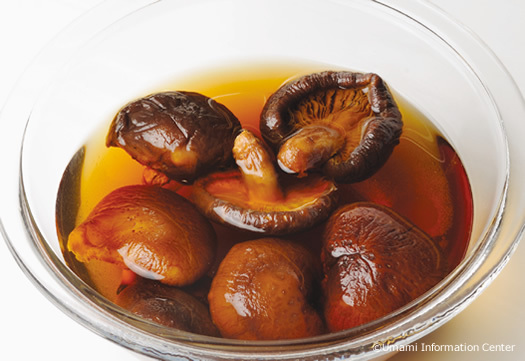 ※You can use niboshi dashi just as a dish or you can mix it with kombudashi. 1. Wash dried shiitake mushroom darts and place them in a bowl of water and leave to soak for half a day. 2. Put the kombu in the water and heat for one hour keeping it at 60℃, then take the kombu out. 3. Add dried shiitake mushroom dashi into 2. 4. Strain 3 with a kitchen cloth, etc.